Tarketts comprehensive range of indoor sports flooring solutions are available in wood, PVC and linoleum. Suitable for multipurpose, multisport and specialist sport applications, they comply with all sports surfacing Standards, including EN14904. And for a limited time, Tarkett is offering a FREE bag of high quality footballs to every school that installs a Tarkett Sports flooring solution over 200m2. 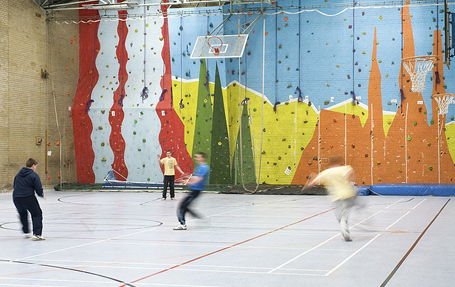 Tarketts Omnisports range offers PVC sports floorings that deform at the point of impact. Developed in three qualities, Omnisport Excel, Omnisport Reference and Omnisport Speed, the composition of each surface is identical, with a choice of several thicknesses to satisfy varying degrees of shock absorption and performance requirements. All three offer a low maintenance PVC sports surface fit for a multitude of sporting events. All Omnisports floors are readily available from stock and come in 2m widths for quick and easy installation, with less welding compared to narrower width sheet floorcoverings. There are a wide range of colours to choose from, including several wood effects. Omnisports Excel and Reference can also be loose-laid, which allows 98% of the flooring surface to be recycled at end of life. Loose-laying also provides natural ventilation between the flooring and the concrete sub-floor, particularly useful for installations over damp sub-floors. Tarketts four wood flooring systems offer maximum flexibility of performance and ease of installation. Each system range provides extreme durability and optimum levels of performance in terms of shock absorption, ball bounce and surface friction. Manufactured in beech or oak using 22mm engineered wood boards for dimensional stability, they offer excellent price/quality ratios. For combination sports surfaces, Tarketts Lumaflex is the ideal sub-surface solution for level sub floors. Lumaflex benefits from an exclusive assembly system and, when combined with a PVC or linoleum surface, it increases the performance characteristics of the system to facilitate the highest standards of sport. Lumaflex Linosport is the ideal surface for all levels of sport as well as non-sports activities, with no need to protect the floor due to the resilient nature of the linoleum top surface. Tarkett also offers cradle and batten levelling systems designed for installations over uneven floors and for those that require a void to be filled to bring the finished floor height to the correct level. Compliant with EN14904, these systems are suitable for use with wood, PVC and linoleum sports surfaces.